The LAV-AT anti-tank missile carrier is a mobile system is capable of defeating main battle tanks and fixed fortifications. It can be used both in defensive and offensive roles. It is one of the variants of the baseline LAV-25 armored vehicle. The LAV-AT was accepted to service with the US Marine Corps in the mid-1980s. Some sources report, that 95 of these vehicles were obtained. The LAV-AT was originally fitted with the Emerson 901 (Hammerhead) weapon stations, which fires TOW wire-guided, optically tracked anti-tank missiles. The same turret was used on the M901 anti-tank missile carrier. A twin missile launcher is mounted on a roof, above the third wheel. It carries two ready-to-launch missiles and provides coverage in 360 degrees. Also there are 14 reload missiles, stowed inside the hull. Missiles are reloaded manually under armor protection. The LAV-AT fires it's missiles only when stationary. 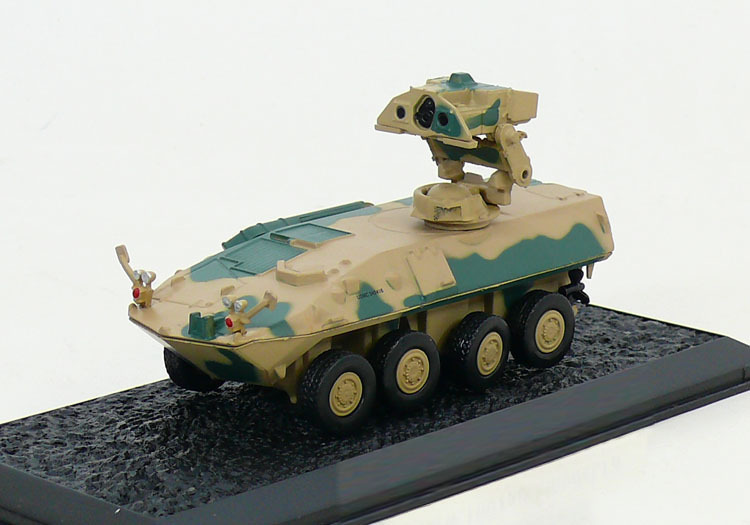 Vehicle also carries a ground mount for the TOW missiles with a hand-held laser rangefinder. This equipment allows to dismount and launch missiles remotely from the carrier. Secondary armament consists of a pintle-mounted 7.62-mm machine gun with 1 000 rounds, which is used for self-defense. Armor of the LAV-AT provides all-round protection against 7.62 rounds and artillery shell splinters. The front arc withstands 12.7-mm rounds. Vehicle also has NBC protection and automatic fire suppression systems. The LAV-AT has a crew of four, including commander, gunner, loader and driver. Crew enter and leave the vehicle via doors or roof hatches. Vehicle has a night fighting capability and can be operated in all weather conditions. This vehicle is powered by a Detroit Diesel 6V53T turbocharged diesel engine, developing 275 hp. Configuration can be switched from 8x4 (rear) to 8x8. Vehicle is fitted with a central tyre inflation system and run-flat tyres. It's mobility allows to keep pace with main battle tanks and reconnaissance forces. The LAV-AT is amphibious with minimum of preparation. It is made fully-amphibious within three minutes. On water it is propelled by two waterjets, mounted at the rear of the hull. Vehicle is capable of fording streams, rivers and inland waterways. The LAV-AT can be airlifted by a C-130 Hercules or larger transport aircraft. It can be also carried underslung by the CH-53E helicopter. These armored vehicles have been successfully para-dropped. It is worth mentioning that currently the US Army uses a similar system, the M1134 Stryker. 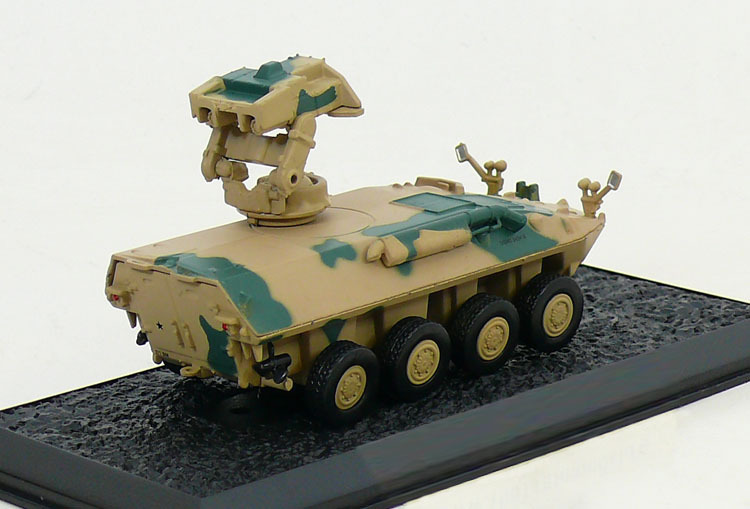 It has a different launcher and is mounted on the Striker ICV 8x8 chassis. This system entered service with the US Army in the mid-2000. The LAV-AT's are expected to remain in service with the US Marine Corps at least until 2024.